In 1497, English King Henry VII sent Italian explorer John Cabot to look for a northwest route from Europe to the Orient that would keep ships from having to sail all the way around Africa. That expedition launched roughly five centuries of steady disappointment and tragedy as generations of explorers—Sir Francis Drake and Captain James Cook among them—met with failure as they searched for the fabled Northwest Passage. Even in modern times, navigating from the Atlantic to the Pacific through Canada’s Arctic Islands has been difficult. The summer of 2007, however, saw sufficient sea ice retreat to change the character of the fabled sea route. 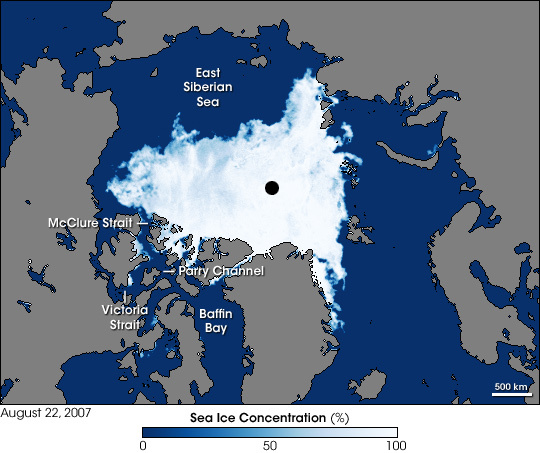 This image shows sea ice around the Northwest Passage as observed by the Advanced Microwave Scanning Radiometer for EOS (AMSR-E) aboard NASA’s Aqua satellite on August 22, 2007. In this image, blue indicates open water, white indicates high sea ice concentration, and turquoise indicates loosely packed sea ice. The black circle at the North Pole indicates no data as the satellite does not make observations that far north. McClure Strait, Parry Channel, Victoria Strait, and McClintock Channel (north of Victoria Strait), all appear nearly ice-free. North of McClure Strait, an area of sea ice remains, but it is fragmented. Multi-year ice (ice that survives more than one melt season) tends to be thicker and more resistant to melt than first-year ice (formed over just one winter). According to John Falkingham of the Canadian Ice Service, most of the multi-year ice melted from Victoria Strait and McClintock Channel in the summer of 2006, leaving these traditionally difficult areas more open. In mid-August 2007, only patchy areas of ice filled Victoria Strait and Larsen Sound, immediately to the north. Falkingham described the Northwest Passage as “nearly open.” Changes in the Northwest Passage were part of a larger pattern of melt in 2007 that also affected the East Siberian Sea. Although nearly open, the Northwest Passage was not necessarily easy to navigate in August 2007. Located 800 kilometers (500 miles) north of the Arctic Circle and less than 1,930 kilometers (1,200 miles) from the North Pole, this sea route remains a significant challenge, best met with a strong icebreaker ship backed by a good insurance policy. Despite the challenges, long-term opening of the passage would have global impacts on trade and natural resource use. NASA image created by Jesse Allen, using data obtained courtesy of the National Snow and Ice Data Center (NSIDC). Thanks to Walt Meier, NSIDC; U.S. National Ice Center; and John Falkingham, Environment Canada - Canadian Ice Service for image interpretation. This image shows sea ice around the Northwest Passage as observed by the Advanced Microwave Scanning Radiometer for EOS (AMSR-E) aboard NASA’s Aqua satellite on August 22, 2007. McClure Strait, Parry Channel, Victoria Strait, and McClintock Channel (north of Victoria Strait), all appear nearly ice-free. North of McClure Strait, an area of sea ice remains, but it is fragmented. Northwest Passage from Encyclopedia Britannica. Accessed August 21, 2007. 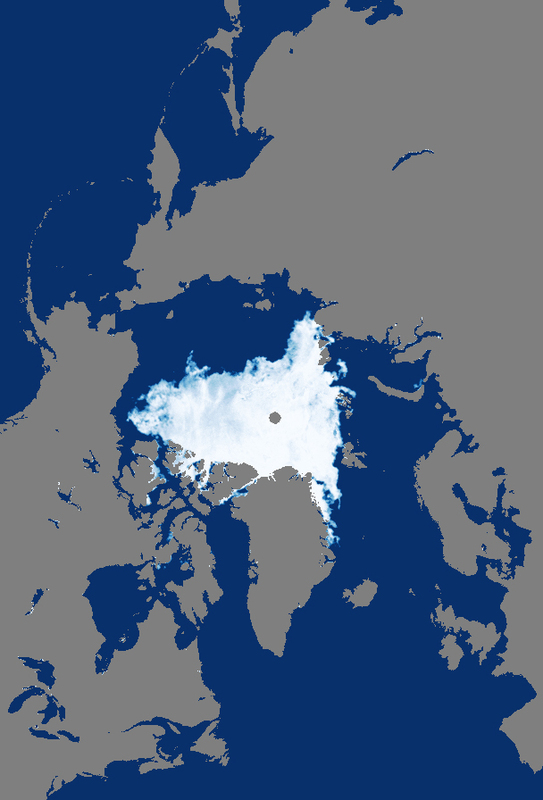 Arctic Sea Ice News Fall 2007 from the National Snow and Ice Data Center. Accessed August 24, 2007.